3DPO is so excited to show off some new signs installed in the Linthicum office! These signs are posted to help guide visitors to the waiting area and patient check out. 3DPO generally likes to keep a low profile, but was very humbled to find himself on a few of the signs - and even Digit (his therapy dog in training) is on one! But then again, his mentor at Dankmeyer, Fabrication Technician Art Ross, was instrumental in creating the signs - so perhaps 3DPO shouldn't have been surprised when they were installed and he saw himself. Every Dankmeyer office has signs of one sort or another. The very first sign anyone might encounter on a visit to a Dankmeyer office is the sign on the door or building! While 3DPO is usually not ON a sign, he has appeared in many pictures WITH signs. He went through his scrapbook so he could share some of his favorites here. A little over a year ago, 3DPO started his internship at Dankmeyer. In that time, he has learned how to do many things. He has visited not only each of the four Dankmeyer offices, but been taken on many field trips as well. He has helped in the Linthicum office remodeling, been to Amputee Walking School, been on TV with the Dankmeyer gang for Manic Mondays, and done a lot of sweeping! In fact, that was his first job - to help clean up the fabrication area. Clara (L) and Shaina (R) meet 3DPO. This summer, 3DPO is very happy to see two new interns at Dankmeyer, Clara Romero Tejera and Shaina Patel. Clara and Shaina are both college students. Clara is from Madrid, Spain, and Shaina is from Bethlehem, PA. Both are engineering students, but Clara is a biomechanical engineering major and Shaina is a mechanical engineering and dance major. They are serious students who will not be spending their time sweeping! They will be observing patients and working on a 3D printing project. After finishing their paperwork, Amy Smith, Administrative Assistant, made the introductions. 3DPO had so many questions for them. How long are you studying at UMD? Shaina: That's funny. I just returned from a year of study abroad at Universidad Carlos III de Madrid in Spain to continue my program at UMD here! Clara: My brothers are engineers, and I admire them. I chose biomechanical engineering because I love biology and it is a way to combine my interests in the two fields. Shaina: Ever since elementary school, I have liked doing puzzles and putting things together. Mechanical engineering is the broadest of the engineering disciplines and I think I can do more with this major. What will you do when you finish your undergraduate studies? Clara: I would like to return to the US to pursue a masters degree. Shaina: I think I would like to work a little before attending graduate school. Why are you interested in prosthetics? Clara: My mother has worked for many non-profit organizations, and when I came across some photos of amputees, I knew I wanted to make a difference and help people in this way. Shaina: I actually heard a TED Talk by Hugh Herr (click here to hear this talk) who created a prosthesis for a dancer who lost her leg in the Boston Marathon bombing. As a dancer, that struck a chord with me. Shaina, a combination engineering dance major is interesting. What is your favorite kind of dance? Shaina: I have been a dancer for many years. Contemporary and hip hop are my favorites. I have some moves. I think I can do the Moon Walk. Maybe you can show me some of your stuff. Also, can I practice my Spanish with both of you while you are here? 3DPO certainly loves to travel, and never misses an opportunity to attend an event, or a class, or a seminar if offered the opportunity. His most recent trip was to join Jamie Dean, Patient Services Representative, and Robert Tyler, CP for a session of the American Orthotic & Prosthetic Association’s Coding and Billing Seminar in San Antonio, TX. Dankmeyer staff regularly attend events to see what’s new in the field and make sure we are up to date on what is expected of us as providers of care to our patients. This seminar specifically dealt with medical coding and billing, which is how we tell insurance companies what we have provided to a patient so we can be reimbursed accordingly. This would be a review class for 3DPO, as he had previously attended this seminar with Mark Treasure and Amy Smith. Did you know, that a single prosthesis might have as little as one code and as many as 20 codes in order to file a claim for the patient? L5000 Partial foot, shoe insert with longitudinal arch, toe filler. Whereas a prosthesis with a Multiprocessor Knee could have as many as 20 codes! There was time at lunch or after the day's classes were over to do a little sightseeing. San Antonio is called Military City, USA because it has one of the nation's largest active and retired military populations. In fact, Brooke Army Medical Center, or BAMC as it is known, is located in San Antonio and is the home of the Center for the Intrepid. Opened in 2007 with over $62 million dollars in private funding, it is a rehab hub for troops recovering from burns, amputations and other serious injuries. The city is also very well known for the Riverwalk along the San Antonio River. The annual Fiesta River Parade is held during Fiesta - an annual two week celebration that ended the day before the seminar began, much to 3DPO's regret. And, of course, they had to make the trek to the most famous of all San Antonio destinations - The Alamo. 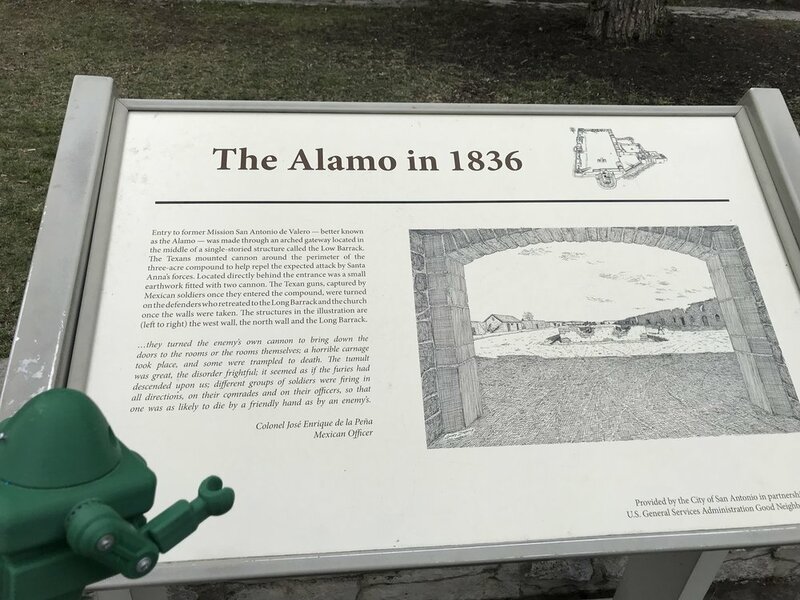 3DPO and Jamie visited the Alamo, which was founded in the 18th century as a mission and fortress. It is currently a World Heritage Site, and is most well known as the site for the Battle of the Alamo, fought in 1836. The battle was part of Texas' war for independence from Mexico when Texas became the Republic of Texas. a little less than ten years later, Texas became the 28th US state. 3DPO enjoyed his short visit to San Antonio and would like to return when he can participate in Fiesta! 3DPO has spent the bulk of his time performing tasks related to behind the scenes functions in the Fabrication Lab, or helping to clean and sweep, or even the random construction project. He has blogged about all of these before. He had also been on some field trips with various Dankmeyer staff members when they went away to attend various classes. It wasn't long ago he asked for some information on the Check In station and everything involved in that. He was helping to deliver packages to Nancy Lee, System Administrator, when he realized how little he knew about equipment that wasn't in the Lab. He was very familiar with screwdrivers and such - he even kept his own set of tools in the back - but he really didn't know a lot about all the other equipment everyone else used. Other than helping Adrienne use the coffee machine one day, taking his turn at kitchen refrigerator cleanup, and helping Heather vacuum at the Cumberland Office, he wasn't familiar with other office equipment. When he asked, Nancy advised him that those items weren't really considered office equipment. What he wanted to know more about were the kinds of things that were in every medical provider's office - computers, and phones, copiers, scanners, the display board in the waiting area, signature pads and those kinds of things. These were tools that didn't build things - they were all more like organizing and documenting tools, and communication devices. But my goodness the things everyone did with them! The IT team was responsible for installing and maintaining much of this equipment and the software that went with it in some cases. But Nancy and Becky (Snell, IT & Marketing Director), also performed support roles in addition to traditional IT tasks. Training users in using different kinds of software, creating forms and collecting data, creating material for the display board, flyers, name badges, assembling the Dankmeyer newsletters, website content and social media (along with one of 3DPO's favorite people and mentor, Art Ross), were just a few things they did. Nancy took some time to give him an office equipment tour - just to see how he sized up compared to it all. Needless to say, in most cases, he was a "bit" smaller than most of it. Becky and Nancy explained that was a pun - because a bit is a computer term for the smallest unit of data used in computers and digital communications. 3DPO remembered a line from one of his favorite TV characters, to which he had a passing resemblance, the robot from Lost in Space - That does not compute! But, really, the whole bit did if you thought about it. Last month, on a very breezy cold morning, 3DPO joined other Dankmeyer staff members to appear on a very early morning TV show - outside! It was his first film experience. And it was exhilarating, or maybe it was just cold. Dankmeyer staff met early to be on the Manic Monday show on Baltimore's WJZ. Hosted by Ron Matz, WJZ is the local CBS affiliate which features local businesses on this Monday morning session. 3DPO did the TV show while perched on Art Ross's shoulder, so he could get a good view. Before the event, Dankmeyer rehearsed the lyrics supplied by Adrienne Castle, Patient Services Coordinator. Adrienne had organized the appearance, and wanted everyone to be well prepared. Adrienne graciously allowed 3DPO to take the microphone and lead rehearsal in the office. You can click here to see the video on the WJZ website. After the event, the Dankmeyer team went to warm up and have a great breakfast at Jimmy's Restaurant. 3DPO took a microphone to entertain everyone with his own rendition of Manic Monday and other songs soon followed. 3DPO has spent some time listening to music and singing in the shower since that Monday, and finds that he likes performance. Since he has a nice cowboy hat, he thinks that Country and Western might be his calling and is considering talking to Cumberland office practitioner Mark Treasure about a recording session. Mark writes this month about his own music in the website blog about Dankmeyer staff members who are out In the Community. Since Mark has some mobile recording equipment, he could bring it into the Baltimore office when he comes for his next visit and make a CD. 3DPO would invite Mark to be a guest artist, and of course all the Dankmeyer staff could do their cover of the Bangles' Manic Monday for old times sake! 3DPO wonders what it would be like to appear on stage with a live audience. While the Dankmeyer staff is, of course, live - they are friends who will applaud even if he couldn't sing a note, because that is what friends do! Maybe he could organize a talent show, because in addition to Mark, other Dankmeyer staff members can play music, or dance, or sing, or act! Maybe they could form a band! Just in case a CD with Mark and his new band could lead to big things, 3DPO has his sunglasses ready for the glare of the studio lights. Though, after windshield sledding during a First Day of Spring snowstorm, he hopes that they will be more immediately useful on sunny spring days.